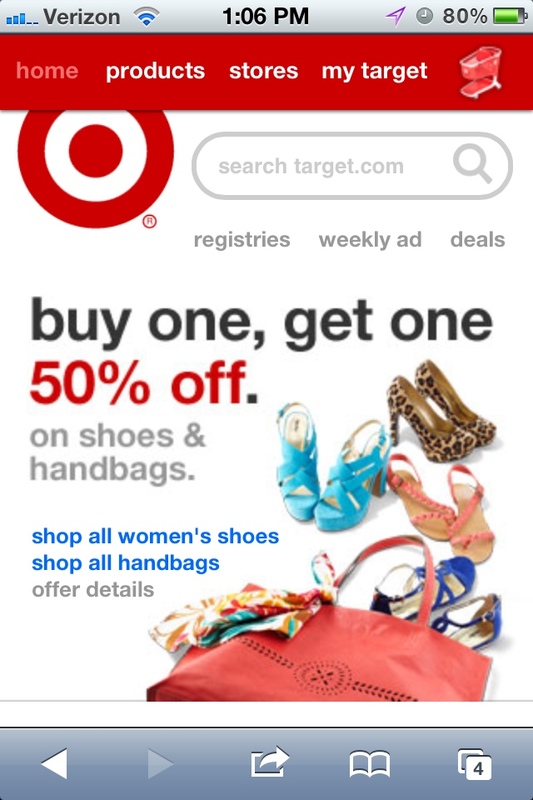 Target.com on a smart phone is a really nice example of consistency between desktop and mobile. And they really started pushing the power of hat mobile could do when theyore leased their new website sometime late last year. The entire website functions more like a catalog than a typical retail website. And the app does a great job of that as well. It is easy (relatively easy. I have never had success with the target search feature) to browse for products and check prices-which is everything at I would want from a retail website. As a frequent target shopper and a user, I appreciate the ability to do a price check on my phone before I even leave the house. And to have the option of ordering onine is an added benefit. Design-wise, I love that as I scroll donwn the page, each item takes up the bulk of the screen. I am not distracted by unnecessary ads or banners…just what I want. As an added bonus, the website also has smartphone detection and displays a notification that there is also an app available for an even better experience. This is something that I’ve noticed that, from a marketing perspective, makes a huge amount of sense—and a lot of companies are doing it (see web app, or a native app? ).